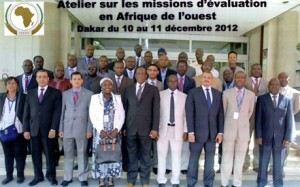 10 –11 December 2012 – The African Centre for the Study and Research on Terrorism (ACSRT) convened a summative workshop on Evaluation Missions undertaken to eight countries of the West African region from 10 to 11 December 2012 in Dakar, Senegal. Participants to the meeting included representatives of the eight evaluated West African member states, namely Burkina Faso, The Gambia, Guinea-Conakry, Guinea Bissau, Mali, Mauritania, Niger and Senegal. 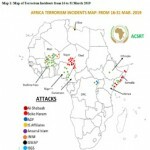 The Sahel Fusion and Liaison Unit (UFL), Committee of Intelligence and Security Services of Africa (CISSA), the Inter-Governmental Action Group against Money Laundering in West Africa (GIABA) and the European Union Commission Delegation to Senegal were also represented. 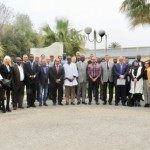 The two day-meeting was dedicated to the sharing, among the participants, the findings and conclusions of the evaluation missions to West Africa and agreeing on the priority areas to focus on. The workshop was organized in the context of an European Union Commission (EUC)- financed assessment programme, covering a total of twelve (12) AU member states. Participants, after reiterating the need for customized, workable, and result-oriented responses, made, among others, the following recommendations : On Enhancing Counterterrorism Legal Capacity: Member States that have not yet ratified the 1999 OAU Convention on the Prevention and Combating of Terrorism , its 2004 Protocol, as well as other related international instruments should take, without further delay, the required steps to do so; Member States should review their national counterterrorism legislations with a view to aligning them with the provisions of the AU Comprehensive Counterterrorism Model Law; Need to Conclude extradition and mutual legal assistance agreements, where necessary, and adoption or review of related legislation to enable Member States to cooperate effectively; On Combating the Financing of Terrorism (FT) and Anti-Money Laundering (AML): The need to further strengthen the capacities of the national Financial Intelligence Units (FIUs); The ACSRT, the Inter-Governmental Acton Group against Money Laundering in West Africa (GIABA) and the Middle East and North Africa Financial Action Task Force (MENAFATF) were encouraged to develop typology reports on money laundering and terrorism financing. On the National Focal Point Structure: The need for countries to view counterterrorism Focal Points as established structures and not as individuals. Hence the need to establish National Fusion Centers; Need to expand the Focal Point’s attributions to include other terrorism-related crimes given the complexity and multidimensional nature of terrorism and its interrelation with other organized crimes. On Information Sharing and Border Control and Management Need to develop computerized national databases with assured inter-connectivity and possibility of being accessed by the services responsible for the prevention and combating of terrorism and transnational organized crime. On Countering radicalization With a view to dealing with the growing presence and increased influence of extremist and fundamentalist rhetoric on local populations, the participants agreed on the need to: Improve governance and develop programmes that help people to be resilient to extremist rhetoric; Encourage scholars and theologians to lead the intellectual debate and dialogue with a view to addressing the factors that influence radicalization and extremism. On enhancing Technical Capacity: The need to provide continuous training and development of technical and operational capacity of member states in the areas of intelligence collection and analysis, border control, critical infrastructure and sensitive sites protection, justice delivery, intervention units, countering violent extremism and the provision of adequate equipment. On the respect of Human Rights while Countering Terrorism: Participants reaffirmed that counterterrorism measures must fully comply with international human rights law, refugee law as well as humanitarian law. 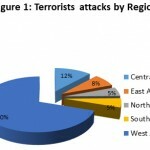 Participants underscored the importance of timely information sharing, the submission of annual reports to the Peace and Security Council via the ACSRT on measures taken to prevent and combat terrorism, and the notification to the Council of all terrorist activities taking place in their countries as soon as they occur. 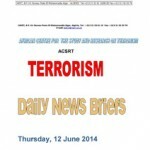 The participants urged the African Union Commission, through the ACSRT, to: Continue and scale up efforts to build the capacity of Member States to fight terrorism, more specifically, the legal and judicial capacities by developing an African Arrest Warrant (AAW) to arrest, judge or extradite persons accused or convicted of terrorist acts. Draw up a list of terrorists, terrorist groups and entities ; Continue consultations and coordination with international partners to provide technical assistance, build capacities and finance national and regional counter-terrorism strategies as well as initiatives, projects and programmes; Strive to broaden the provisions of resolution 1817 (2008) of the UN Security Council on individuals, groups, companies and entities which support Al-Qaeda to include other criminals such as traffickers on drugs and humans . Finally, participants commended the work conducted by the ACSRT assessment team and expressed their wish for these evaluation missions to be carried out on a continues and frequent manner.